Personalise them with a massage or select individual treatments for that perfect gift. You can also now buy packages as vouchers. 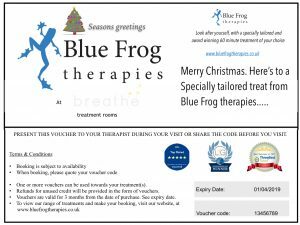 “Restorative Frog 60” is the perfect package of 3, 60 minute treatments of your choice, once a week for just £100. follow the link about for vouchers and to find out more….